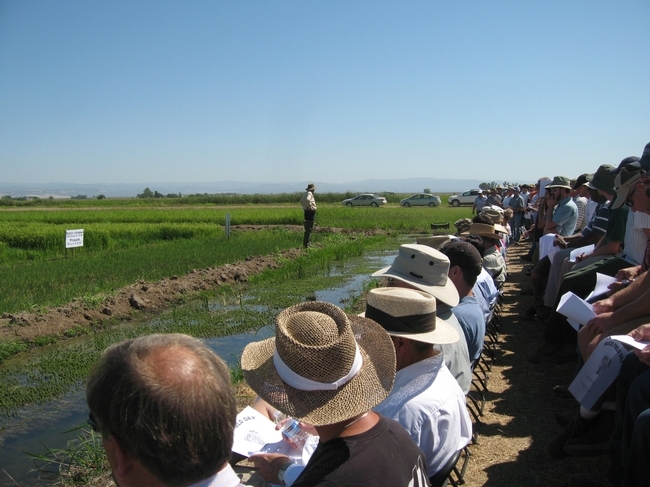 The annual Rice Field Day will be Wednesday, August 28, 2013, at the Rice Experiment Station (RES), Biggs, California. You and your associates are cordially invited to join us for this event to observe and discuss research in progress at RES. Rice Field Day is sponsored by the California Cooperative Rice Research Foundation (CCRRF) and University of California (UC), with support from many agricultural businesses. Following is a brief outline of the Rice Field Day program (updated program here). The program will begin at 8:30 a.m. with a General Session that serves as the Annual CCRRF Membership Meeting. Posters and demonstrations will be in place during registration until after lunch. Field tours of research will emphasize progress in rice variety improvement, disease, insect, and weed control. The program will conclude at noon with a complimentary lunch that includes rice. The RES is located at 955 Butte City Highway (Hwy. 162), approximately two and one half miles west of Highway 99 north of Biggs, California.